Valencia L. Johnson is the Project Archivist for Student Life at Princeton University. A sunflower state native, she holds a Bachelor of Arts in American Studies and History from the University of Kansas and a Master of Arts in Museum Studies from Baylor University. She joined the University Archives, Princeton University Library, as a John Foster and Janet Avery Dulles Archival Fellow in 2017. Since then, Valencia has processed various collections containing analog and born-digital materials, designed exhibits, and served as an instructor for the inaugural Archives Research and Collaborative History (ARCH) Program. Valencia is the incoming co-chair of the Women's Collections Section of the Society of American Archivists. 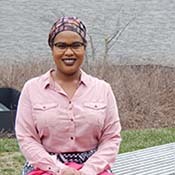 In addition to her involvement with professional organizations, she is also involved with several cooperative organizations, including Social Networks in Archival Context (SNAC), Project STAND, and Archives for Black Lives in Philadelphia.